Today statistics on the Australian labour market has been released. The data was below the forecast. Unemployment rate remained at the previous level of 5.7%, while number of new jobs in October was 1100 against expected 10 000. Revised data on the same indices for September showed that unemployment rate increased by 0.1%, while number of new jobs amounted to 3300 instead of 9100. These factors had a negative impact on the Australian dollar and the AUD/USD rate fell to the level of 0.9470. The nearest support level is 0.9440; next support levels are 0.9400 and 0.9370. Resistance levels: 0.9480, 0.9450 and 0.9525, the latter one is the main target for the “bears”. Weak data on Australian labour market is likely to prevent the rise in the pair and may cause the decline. 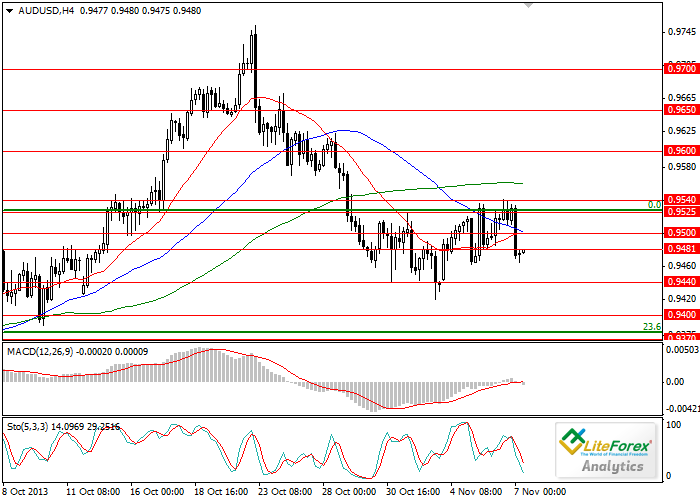 Short positions should be opened below the levels of 0.9440 and 9.0375.